Ngapali is located in Rakhine State and stretches along the Bay of Bengal and it lies in Rakhine State of Myanmar. Ngapali is said to be one of the best beaches in Myanmar where most natural are untouched where visitors can enjoy the true natureof the beach itself. It is famous for its natural and unspotted beauty up to this day. The beach stretches about 3 km with soft white sand fringed by coconut palms. It is the best place for those leading a modern life in urban areas and looking for a place to enjoy the nature beauty of the beach itself. The beach is unlike like other beaches around the world where it is very crowded along the beach and hawkers persuading visitors to buy their products. There are other organized recreational activities where visitors can participate such as: beach strolling, cycling and many more. It has also the perfect sunbathing ground. The sea cobalt blue, without any dangerous marine animals and clean as well. There are a few fishermen villages nearby and it can be arranged to visit to those villages on bicycle tour. Most local people believe that the best time to visit the beach is in during October and May of every year. 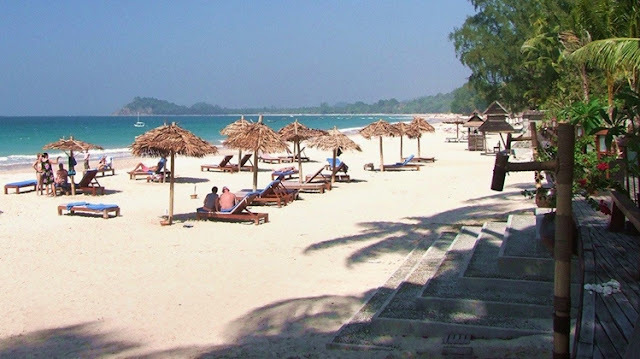 Thandwe which is situated near to Ngapali beach is one of the most suitable place for those who would like to enjoy a modern yet but not too modern town near the beach for many other relaxation activities. Ngapali Beach is one of the loveliest places in Myanmar; it is also one of the most unspoiled beaches in the world, with miles of pure white sands skirting the crystal clear waters of the Indian Ocean. Actually, Ngapali is not one single beach but it is a series of beaches interconnected with small fishing villages stretching from Mazin where the airport is located, to Lontha on Mayo Bay where coastal steamers dock in a sheltered anchorage.